At CMI we work closely with content producers, and compare notes about tips and trends. These days, we’re seeing a wide range of indicators that video can not only change the way we learn, but alter the structure and process of the learning environment. Teens consume video content on YouTube regularly—85 percent of this age group, according to The Pew Research Center — which makes the medium a natural, familiar vehicle for learning. Employees are 75 percent more likely to watch a video than to read documents or manuals, according to Forrester Research. When it comes to retention, videos make employee training more effective than traditional methods. One week after a training session, the average employee will forget 65 percent of material covered, and will have forgotten 90 percent six months later, according to the SAVO Group. 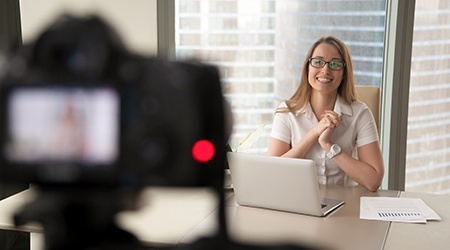 But when video was incorporated in the training, the retention was initially 9 percent more effective one week later — but a whopping 83 percent six months later. This suggests that with video, retention actually grows over time. An increasing number of organizations (including many software solutions driven companies) offer academies that allow their clients to consume training segments when and where they wish. Class time, then, is whenever it works for the student. Flipped learning is a buzzword in many different work and educational settings these days. The idea is that before the class setting, students/trainees watch a video for basic information on a subject — the sort of thing that would be traditionally spoken live in a lecture format. Then the classroom time is used for practice, answering questions, and applying the learning to real-life scenarios. The goal: Learners can digest lecture content at their own pace, and explore the application of the content more deeply during group time. Grab a student’s attention, spark curiosity, and stimulate a focused discussion guided by the instructor — but without the instructor needing to be the one providing all the content. Show, visibly and audibly, real-life examples or case studies. Demonstrations focused on contrasting cases help students to achieve expert-like differentiation (Schwartz & Bransford, 1998). Be an archived resource that students can access anywhere and anytime — from first exposure to future review. For novice students who have little previous knowledge of the subject matter at hand, video can help illustrate the concept more easily for many topics and concepts (Reiser & Dempsey, 2007). Provide multiple perspectives of the same material rather than relying on a single viewpoint (Brunvand, 2010). As an alternative to an in-class live lecture, video makes use of the multiple experts in the subject matter, and allows the live instructor’s expertise to serve as “a guide on the side” in an active learning environment. Involve students in creating media as a way to assess their understanding. Student-led media projects encourage collaboration, accountability, creativity, and mastery of ideas and concepts. For decades, researchers have been studying the connection between visual clues, the memory process, and the recall of new knowledge. We at CMI would enjoy discussing with you the ways to bring these benefits of video-based learning to your largest potential audience.